Is Tony Abbott a Sociopath? 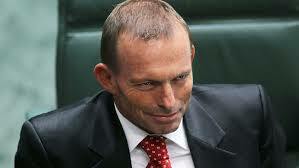 Actually, I have no idea whether Tony Abbott is a sociopath or not. I am not a psychiatrist. I am also not going to put up a list of Hare’s traits of a sociopath checklist and then trawl through Tony Abbott’s long history of violence, bullying, intimidation and abuse to find instances of quotes or actions that may correspond with that checklist. The problem is not so much that there are sociopaths, they have always existed, and will always exist in our societies. The problem is we keep electing them to govern over us, then bizarrely, expect they will govern inour best interests. Like a nation of sheep we bought the lies and myths propagated in the Murdoch and Murdoch mini-me (ABC) media about how Tony is a changed person. Not even three months in, and that choice at the ballot box is proving disastrous. The almost cult-like worshiping of the thug who conned his way into the Lodge means our media has to tell us on a daily basis that black is white in order to maintain the illusion that Tony Abbott is the new messiah who will save Australia from the regional peace and AAA prosperity that Labor delivered us. This is not who we are, there is nothing peculiarly Australian that requires us to vote in a violent, abusive, bullying man to become Prime Minister. Just as there was nothing in the German people in the 1920s and ’30s that meant they were more likely to vote in a fascist government. The only question is why they continued to support the fascist government, when it become blindingly obvious their leader was a dictator. The lust for power, the easy access to the bottomless ATM known as taxpayers, the ability to get courts and federal police to bend to your will, is a lure so strong that those with evil and malevolent intentions find it difficult to resist. For these people, the ends justifies the means. The ‘ends’ being access to unlimited power, the ‘means’ is throw anyone under the bus that gets in their way. The trouble is, when the elected officials use lies, propaganda and intimidation to get there, they need to reproduce those tactics on a much larger scale to maintain their position of power, then our democracy gets thrown under that bus. Do we still think our elected leaders act in the best interest of our country? As recent events in the US has shown, the Right Wing Teaparty republicans were prepared to crash the US economy by hitting the debt ceiling because they are ideologically opposed to poor people getting medical care that doesn’t result in bankruptcy. Our current government (it seems) is governing for the benefit of select few – Tony Abbott, George Pell, Gina Rinehart, Rupert Murdoch. This current governments policies are ideological, and designed to transform our environment to maximise profits for mining magnate Rinehart, transform our economy to benefit a foreign billionaire Murdoch, push the stone-age values of a religious institution, and our work place laws to benefit a handful of foreign corporation and not millions of people who work for their wages. We, as a nation, have surrendered our freedom, optimism, compassion, generosity, empathy, in exchange for security* and ended up with neither. * an illusion of security, both budget and border. I say illusion because the crises that Liberals promise to save us from exist only in their own minds and in newspaper headlines, and do not reflect reality. Our budget under Labor was not an ‘emergency’, it was one of the best in the world, our borders are not in crisis because of a couple of boats.